This one's for you, Yuki dog! "Dog Park" fabric collection by Sarah Frederking. 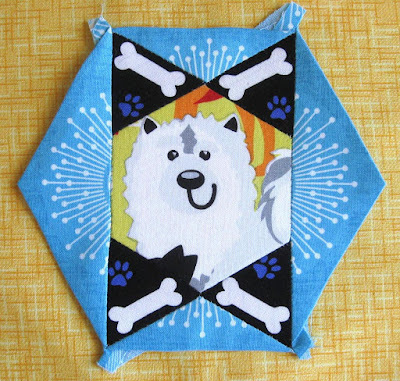 aww, I just came across your post and am happy to find that you used my fabrics to celebrate and commemorate your sweet dog. A dog lover myself, I know how hard it is to say goodbye. I hope with time your sadness will wain. I still miss my dog, but have nothing but happy memories of her. All the best. Hi Sarah, thanks for your kind words. The "Yuki dog" on your fabric looks just like my dog--very happy, playful and fuzzy. She will be missed but will always be in our hearts. I am the fabric rep for the StudioE collections in TN, GA, AL and KY and love your work. Glad we made this connection! Have you seen "Dressed" yet?